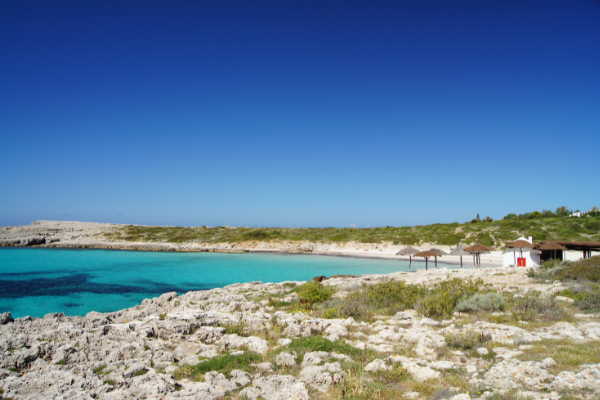 With more beaches than Ibiza and Mallorca combined, Menorca has nearly 700 square kilometres of beach and 216 kilometres of coastline. With plenty of beaches to choose from, we wanted to share a selection of our favourites. 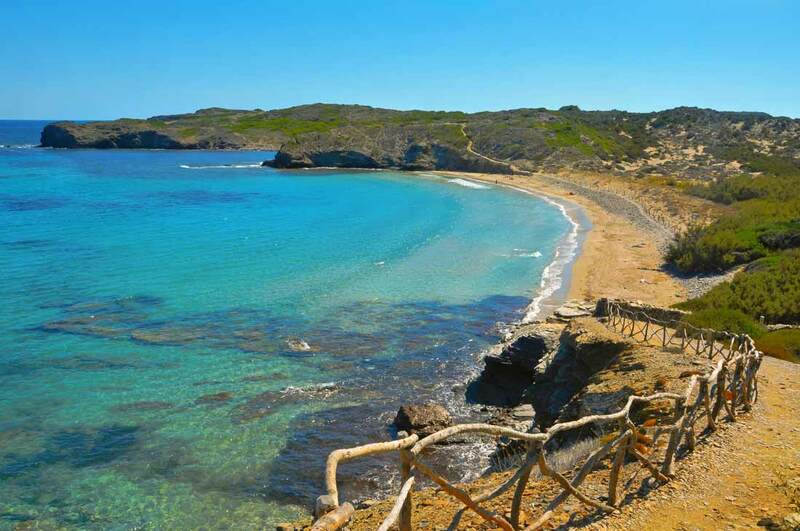 Cala Mesquida is located on the east coast of Menorca and offers a fairly remote beach with lovely white sand and beautiful crystal blue waters. The beach shelves gently, so it is ideal for families with children allowing peace of mind for any parent. Likewise, a little van stops by and sells lovely ice creams and drinks for visitors during the summer months. Be aware this beach does not discourage nudism, especially the locals, so if you want to avoid these scenes it is advisable to stay towards the east end/middle of the beach. A beautiful, peaceful and tranquil beach located on the northeast coast of the island, perfect for those who want to get away and relax. The beach is long and allows for lots of privacy, be aware, nudism is not discouraged so be prepared for this, however, there is the family section which is located closest to the parking area. The sea is crystal clear and has a steady gradient into deeper water, making it safe for the less confident swimmers and little ones. Punta Prima is located on the south-east corner of the island with a long beach of fine white sand, ideal for families and couples alike. 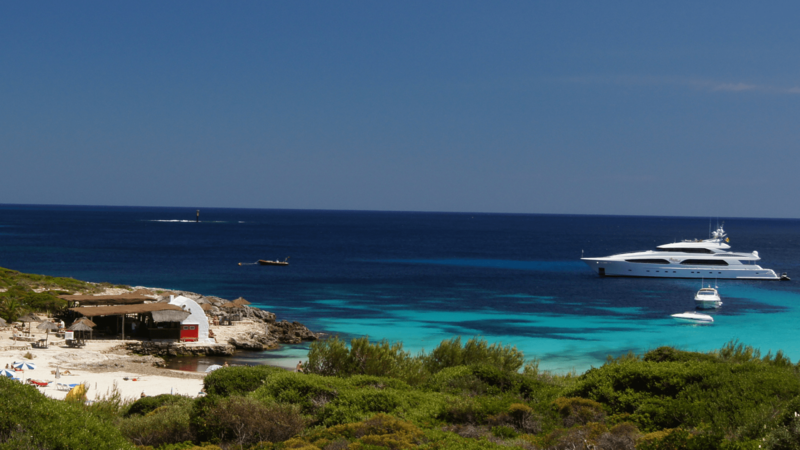 The beach overlooks the island of 'Isla del Aire' with its infamous lighthouse. Situated in a small but growing resort with a good selection of bars and shops and easy parking right by the beach. Facilities include sunbeds, water sports hire such as kayaks/pedalos and a small beach bar for refreshments. Please note due to the location it can be dangerous with strong currents when winds are strong but a flag system is in operation for day-to-day guidance. 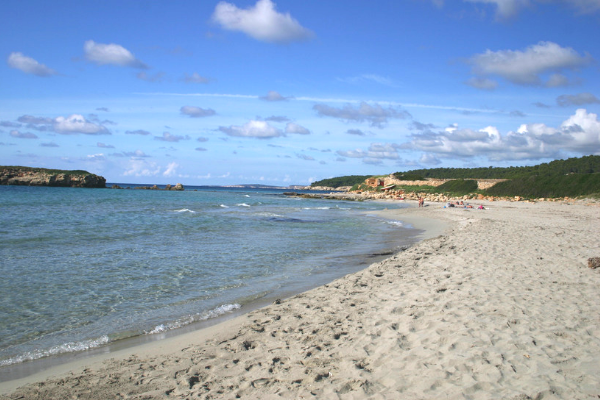 South of the island, Binibeca beach is a lovely family-friendly beach with gentle shelving. Families can enjoy playing in the warm waters or exploring the west of the beach, which has a rugged volcanic rock peninsula great for rock pooling. Binibeca beach is well protected with lifeguards and you can also hire sun loungers, parasols, electric boats and pedalos. Take a break from the sun and enjoy a light snack or drinks at Los Buscaneros, the small beach bar, which has been running since the early 70's! The beach is easily accessible by car with a car park just at the rear or if you're looking to walk in with the little ones, it's accessible by wheelchair or pushchair. 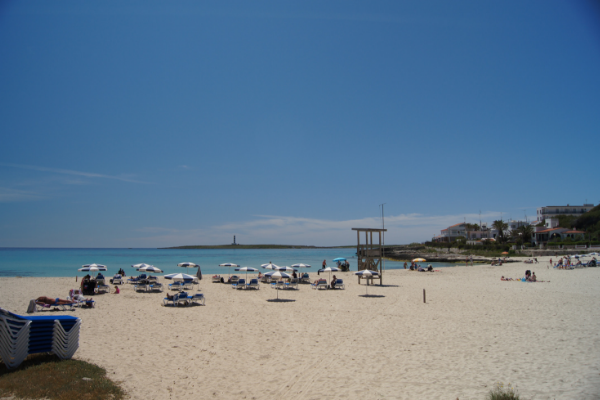 A little further west than Son Bou and through the village of Es Migjorn Gran is Santo Tomas. The beach of Santo Tomas is effectively split into two beaches. The eastern beach (Playa Santo Tomas) is white and sandy and backed by hills. The main hotels in the area look out onto this beach. There are lots of sunbeds, parasols and watersports available for hire here. The western side (Playa San Adeodato) is longer and the water here is relatively shallow. Once you pass the pebbles as you enter the water, it becomes clear and beautiful. There’s a duty lifeguard, a beach bar and lots of watersports including windsurfing and jet skis. 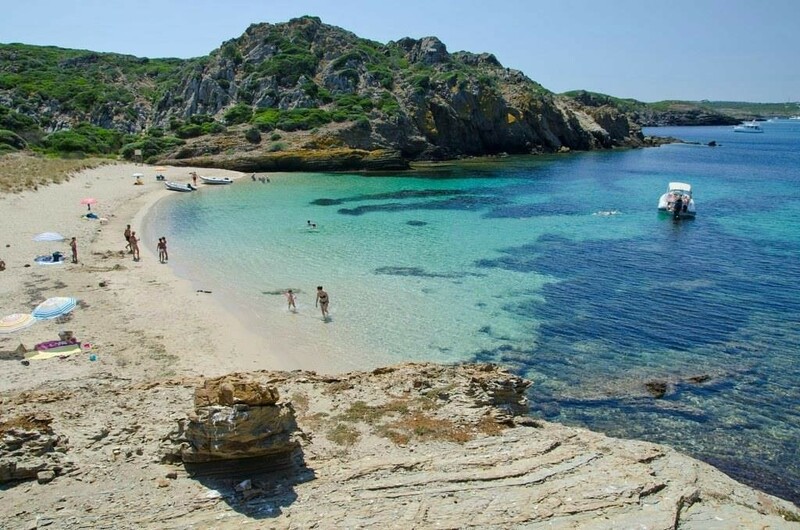 Known to be the quintessential family beach of Menorca, Platja des Grau is the perfect beach to take the young children. With shallow turquoise waters that covers far into the sea, children can happily play without the need of worry from parents. This beach is backed by the low dunes of the S’Albugera des Grau nature reserve, where one can take a short walk into and feel as if they’re in the deepest countryside. The village of Es Grau is at one end with a few bars and great restaurants overlooking the bay; one of the best places to flop and catch the rays, take a stroll, eat a long lunch, and just be. Platja d’en Tortuga is an unspoilt beach that opens to a wide tranquil bay, with great views of the lighthouse in Cap de Favaritx. 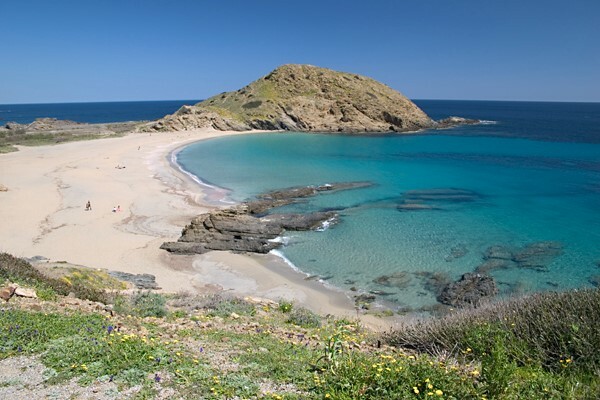 This beach is ideal for those who want an escape from the busier beaches on the island; its surroundings boasts great character by the variety of stones, shades brown and grey; and sand dunes with pretty wildflowers. If you’re lucky, you’ll even get a chance to catch the baby turtles making their way into the sea. 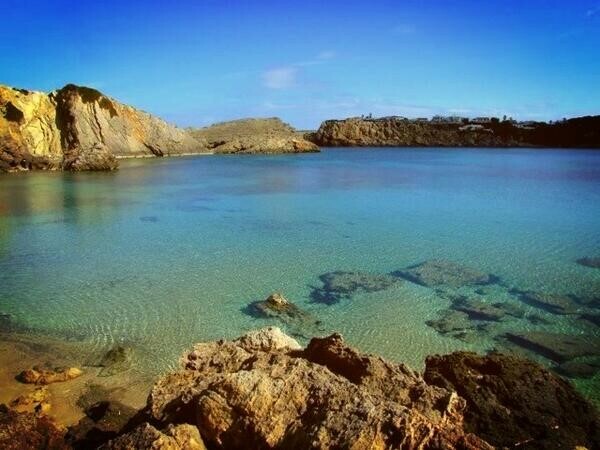 If you want to discover Menorca's beautiful beaches then why not consider a villa holiday. Get in touch using our enquiry form and one of our island experts will be in touch to help you start planning your stress-free holiday!